Photography marketing is a critical and ongoing element of running a business so how can you make sure your communications are effective and not missing the mark? Having previously outlined the necessary first steps to setting up a photography business we will now focus on some of the most important ones in greater detail. Most photographers recognise the importance of marketing but struggle to know what to spend their time and potentially money on to ensure they effectively build and maintain awareness with the right customer base. Remember that there is no ‘golden bullet’ and photography marketing today is made up of many facets and areas for consideration. Modern photography marketing is very customer-focused thanks to the impact of social media and the ability to have ‘conversations’. It is about knowing your target customer, creating the right product to satisfy their needs, creating a desire for that product and letting the right people know you have it. It is not sales – that is the result of effective marketing. If people don’t know about you, your products and services, they can’t buy from you. In this blog post we discussed the importance of doing your market research and being able to clearly describe your target market – who they are, how they live and what problems they have that need solving. It is essential to understand that marketing is an ongoing conversation that will enable you to make changes to your message or even your product to ensure you are constantly relevant and ahead of the competition. Effective photography marketing is also about the timing being right for the client which is why articulating your message well and often ensures you will be front of mind when they are ready to purchase. Search engines such as Google have the ability to deliver your brand and content to potential clients but featuring highly in search engine rankings will only happen if you have put the necessary effort into your Search Engine Optimisation or SEO. Once I gained a better understanding of what affects rankings I spent some time editing the content of both my website and blog posts and saw an immediate change in relevant traffic and enquiries. I delve deeper into effective photography SEO in this post. The explosion of social media has resulted in a massive choice of communication channels that lead to your ideal clients. You cannot (and should not) try to master them all – part of the challenge of marketing today is finding out which social media platforms work best for you and your target market. Posting regularly is important but rather than posting every day think carefully about how relevant the content is and if it is engaging for your ideal client – if it is addressing their needs rather than your own. And critically make sure that you are marketing the benefits of your photography not the fact that you take pictures! I have discovered in the last year that my brides are more likely to be on Instagram than FB which has resulted in a change to my marketing strategies. This doesn’t mean that I don’t use Facebook anymore but I have learnt that the organic reach of FB is so low that you are better off viewing it as an advertising platform and putting some budget behind carefully planned and targeted posts. You need to become very familiar with FB’s AdManager and be clever with how you use the 5 key demographics. For example, you can target engaged 30-year-old women in London who have an interest in designer brands. I have never found paying for print advertising works well for photographers. Word of mouth is the most effective form of marketing in terms of return on investment and also the most sustainable. There are 2 key audiences for photographers – clients and industry contacts. Photography clients should be viewed in terms of their lifetime value to the business and your customer service should exceed expectations and build trust and loyalty for the long term. Testimonials from past clients are very powerful forces in the purchasing process because trust tops the list of why people buy. If you believe you have done a great job and have a very happy customer don’t be afraid to ask them for a few words about their experience of working with you. Photographers, particularly in the wedding market, work alongside other businesses all the time and they can become a key referral source. Building industry relationships takes effort and time so be very careful about aligning yourself to the right kind of businesses who have the same kind of clients otherwise the referrals will not lead to bookings. The same thought process should be applied to decisions about booking space at fairs and exhibitions – only spend the investment if you are certain that the right kind of clients will actually be attending. I am giving all of the above advice based on the experience of marketing the Kate Hopewell-Smith Photography business and it has worked incredibly well and I have built a fantastic network over the years that benefits all involved. Interestingly when Brent and I created the brand for Photography, Film and Air byLumiere we realised very quickly that we were going to have to think differently. We positioned byLumiere as a premium brand and our marketing is focused at a high-end consumer (note the word premium and not luxury – luxury branding has its own complex set of rules and you can read more about photography branding here). Our target clients are not easy to get to and are very swayed by word of mouth and the ‘right’ visibility. We are currently working hard to build new contacts and create relationships with other luxury wedding vendors. 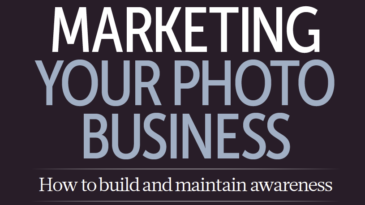 This series was commissioned by Digital SLR Magazine to help photographers understand the essential steps to set up a professional photography business.